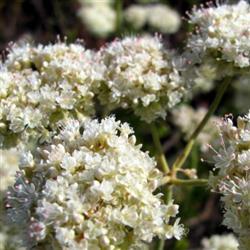 This is the most common buckwheat that grows in California. It is incredibly drought tolerant and hardy. It's long flowering season (almost year-round) makes it an important nectar source for butterflies and pollinators so be sure to include it when planning a habitat garden.Birds also enjoy the seed heads in fall. Flowers are a pale pink when in tight bud, becoming white as the flowers open, and them becoming rusty brown as the flowers dry out. This gives some added interest and fall color to gardens in the autumn that is unique to California. Birds also enjoy the seed heads in fall.